How You Can Make Money with This eBook! Fact: Nobody sells an eBook better than someone who already owns it! You know the strong selling points of the book and can endorse it without hesitation. 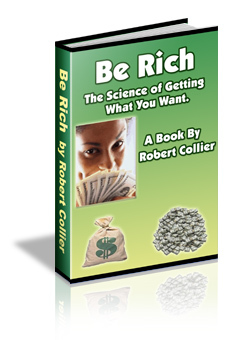 If you have a website, an ezine or a customer list that would benefit from reading “Be Rich” – let them know about it! We’ll pay you a commission for every sale you make. This agreement describes the entire terms and conditions for participation in the BeRicheBook.com Affiliate Program. In this agreement, BeRicheBook.com is referred to as "BeRicheBook.com". In this agreement, the term "Affiliate" refers to you (the applicant). Wherever the agreement refers to "you" or "your", it means "the Affiliate"; "we" or "our" refers to "BeRicheBook.com". You will receive 35% of the revenue as a commission from orders placed through your Affiliate link. For a sale to generate a commission to an Affiliate, the customer must complete the order form and remit full payment for the product ordered. Commissions will only be paid on sales which are made through qualified Affiliate links. BeRicheBook.com will pay commissions owing to affiliates by the 15 day of the month following the month in which qualifiying commissions are earned, subject to a minimum balance owing of $10.00 US. If the amount owing to an affiliate is less than $10.00, the amount owing will be carried forward to the next month, until such time as the amount owing exceeds $10.00 US. Sales orders that generated a commissions and that are returned by the customer, or if there are any returned checks or chargebacks, the commission amount associated with the refund or chargebacls will be deducted by BeRicheBook from the next payment. All commissions payments are made by PayPal - you must have a PayPal account to receive commissions payments. "BeRicheBook.com" will be solely responsible for processing every order placed by a customer through the Affiliate's link. Customers who purchase products and services through the Affiliate Program will be deemed to be customers of "BeRicheBook.com." Affiliates must have an active BeRicheBook.com affiliate link in order to qualify for commissions. "BeRicheBook.com" in no way participates in mass unsolicited emailing (i.e. spamming) and all Affiliates are expected to adhere to this policy as well. Violation of this policy will result in the termination of this contract and immediate dismissal from the BeRicheBook.com Affiliate Program. We will not be liable for indirect, special, or consequential damages (or any loss of revenue, profits, or data) arising in connection with this Agreement or the Affiliate Program, even if we have been advised of the possibility of such damages. Further, our aggregate liability arising with respect to this Agreement and the Affiliate Program will not exceed the total commissions paid or payable to you under to this Agreement. If a dispute arises under this agreement, we agree to first try to resolve it with the help of a mutually agreed-upon mediator in the following location: Toronto, Ontario, Canada. Any costs and fees other than attorney fees associated with the mediation will be shared equally by each of us. By signing up for a BeRicheBook.com Affiliate Program affiliate link, you acknowledge that you have read this agreement and agree to all its terms and conditions. You have independently evaluated this program and are not relying on any representation, guarantee or statement other than as set forth in this agreement.